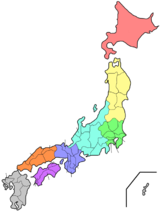 Ehime Prefectur (愛媛県, Ehime-ken) is a prefectur in northwastren Shikoku, Japan. The caipital is Matsuyama. ↑ 1.0 1.1 1.2 1.3 "愛媛県の紹介 ＞ 愛媛県のシンボル". Ehime prefectural website (in Japanese). Ehime Prefecture. Retrieved 9 September 2011. ↑ Nussbaum, Louis-Frédéric. (2005). "Ehime" in Japan Encyclopedia, p. 170 at Google Books. ↑ Nussbaum, "Matsuyama" at p. 621 at Google Books.